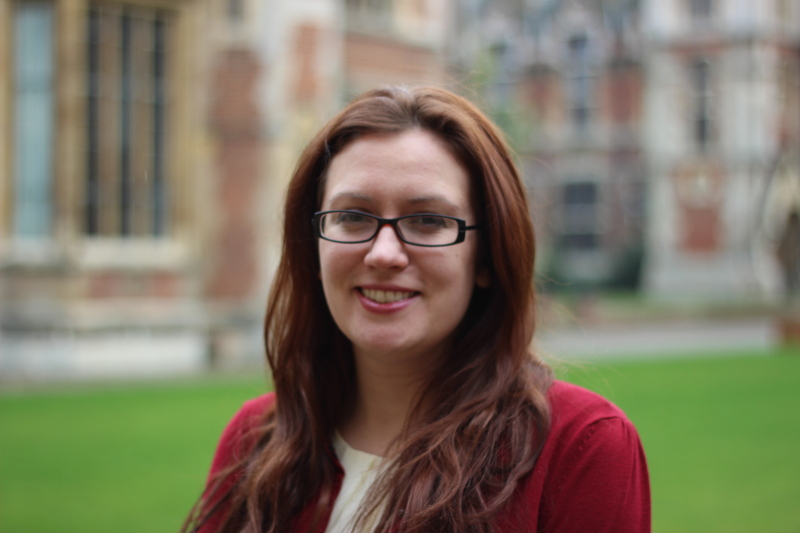 Beth Singler is a PhD candidate in Theology and Religious Studies at the University of Cambridge. Unlike the majority of PhDs in her faculty who are interested in long dead Theologians, difficult questions about the nature of god or translating dusty texts, Beth is researching contemporary religious movements online. In particular her thesis is on the Indigo Children, an idea from what is often called the New Age Movement. 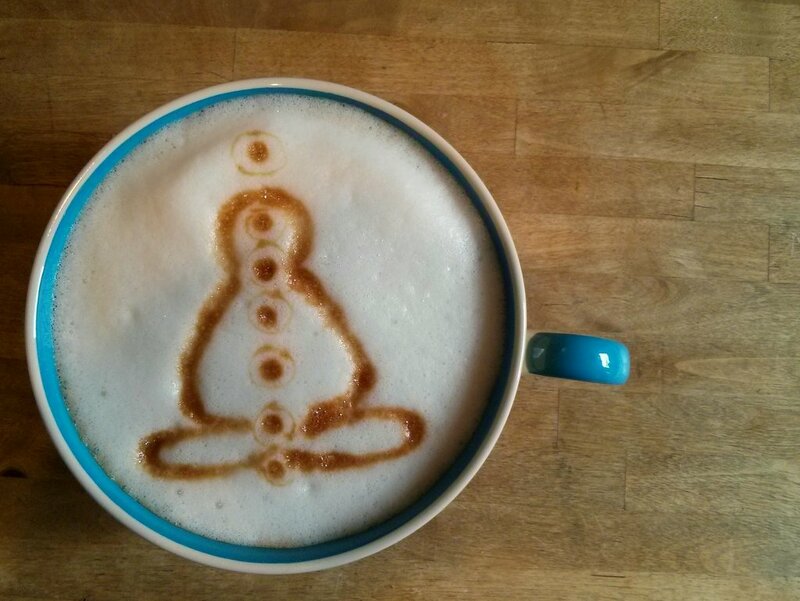 The seven chakras of the body are aligned – with coffee. BS: I’m very interested in New Religious Movements (NRMs), in particular those that have a strong online presence. A lot of NRMs do now interact primarily online because their ideas might not be accepted by the mainstream, or indeed, they might be ridiculed for them, and the Internet enables people who self-identify in new ways to find each other. For my PhD thesis I am looking at the Indigo Children who might not be entirely defined as a religious movement, but are definitely a new community of self-identifying people who communicate regularly through social media about their spiritual ideas. AA: Okay, now you must know what the next question is going to be… what are ‘Indigo Children’? BS: You surprise me! Briefly, the Indigo Children are seen by some as a special generation of children who started being born in the early 80s. They were identified by a woman called Nancy Ann Tappe who claimed to be a synsthete (seeing colours instead of other sensory input) and a clairvoyant. She said that she saw people’s “life colours” and that each one defined a progressive state in humankind’s evolution. Others have taken Tappe’s idea and described Indigos and their problems further, as well as exploring new iterations such as Crystals, Rainbows, Dolphins, Blue Rays, Platinums, Angels on Earth, Starseeds, Beautiful Silent Ones, etc etc. Although called Indigo “Children”, Indigos can be small children, teenagers or adults. And there are also those who were born prior to the 1980s who see themselves as Elder Indigos, or forerunners of the explosion in numbers (especially those who involved themselves with the counter-cultural revolution of the 1960s). Many indidivuals don’t seem to know that they ARE Indigo Children until they come across the term online, or a friend mentions it, and then their difficulties with fitting into structures and systems suddenly make sense. AA: You mention that a lot of these individuals do not know they are ‘Indigos’. Is there a list of criteria or certain traits that identify them? “•They are very intelligent, and very oriented toward their purpose on earth. •They come into the world with a feeling of royalty (and often act like it). The full list, and later versions, describe a combination of a sense of entitlement and social awkwardness that can be seen or diagnosed by others as behavioural problems or ‘special needs’, and Indigos may have problems fitting into society’s main structures such as education and the workplace. Seeing Indigos as ‘problem children’ or ‘children who just don’t fit in’ arguably provides answers for both parents and those who begin to identify as Indigos in adulthood. The former then have a reason for their child’s behavioural problems and can hold them up as ‘special’, and the latter also now have an explanation for their difficult or even traumatic childhood. For both, finding the Indigo concept can be like a moment of revelation, or even conversion. Many of the Indigos I have interviewed describe how reading about the Indigo Children was like finding out something that they knew all along, but had never had a name for before. AA: What was it that interested you in particular about Indigo children? Why did you choose to focus on them for your research project? I’m very interested in the adoption and adaption of established discourses and narratives for spiritual ends. So in the case of the Indigo Children there is a mix of scientific theory, evolutionary theory, spiritualism, conspiricism and utopianism that picks up from more older sources. Contemporary religion (or spirituality, and the difference is a part of a huge debate I can’t go into here) does seem to engage in more creative play with sources in the 20th and 21st Centuries. And some of my other research is on more consciously ‘invented’ religions, to use Cusack’s (2010) term, such as Jediism and some more obscure online forms. AA: I expect those who subscribe to this view of their children or themselves as Indigo face a lot of skepticism. (I’ll admit to being skeptical myself.) How do you approach your research on a subject like this, especially the interviews? One of the first Indigos I interviewed asked me if I was just going to “call them all a ‘bunch of whackos’?”. Well, apart from the fact that a one sentence PhD thesis is pretty rubbish, I happen to think that they are acting in an eminently rational way that humankind has used for centuries. You can call it at its basic level ‘making sense’, or to use a fancy religious studies idea, that they are creating theodicies, ideas produced in order to understand the presence of evil in the world. Evil as in the problems that they face every day. Understanding where and how these ideas come about is far more interesting to me than whether they are right or not. Also, as a social anthropologist it is never my place to interrogate the truth of person’s ‘making sense’. Personally, as what you might call a militant agnostic, I’d also say my mind is so open-minded I’m at risk of it falling out! AA: If you could share one particular aspect of your research with others (so far) what would you want them to know about either New Age Movements, or Indigo children, or this type of research? I think that the main aim of my work – which may seem surprising since I research these seemingly exotic evolved psychic children, Jedi, pagans, Scientologists and many other forms of online created spiritualities – is to show how mundane the rational processes they are engaging in actually are. I propose that they are merely people being people to each other, for good or ill.
AA: Thank you so much for taking part in Penny University and sharing your research with everyone. I imagine there’s now going to be a Google stat spike in searched for ‘Indigo children’. Beth Singler is a PhD student at the University of Cambridge specializing in the social anthropological study of New Religious Movements online. Combining traditional fieldwork with digital ethnography, Beth explores the new definitions of self that multiple on the Internet. Her PhD is on the Indigo Children, but she has also written about Wiccans, Jedi, Scientologists, pop-culture religions and various online subcultures. She has her own blog at http://bvlsingler.wordpress.com/ and you can follow her on Twitter via @BVLSingler. A little over two weeks ago Penny University held its first ever live event as part of the Manchester Science Festival. The event was called “21st Century Coffee House” and we invited people to join us at the MOSI cafe for a 21st century coffee house experience, at a 17th century admission rate (1p)! Tom Booth (University of Sheffield) – Where’s my mummy? : Searching for mummification in the British Bronze Age: A look at how the destructive procecesses of decomposition may aid in the identification of funerary treatments that were practiced in the past. Sarah Moller (University of York) – From Oranges to Climate Change: Find out how oranges affect air quality, why clouds are influenced by this, and why some scientists thought a giant hose pipe could be the answer to climate change. Naomi Pollock (University of Manchester) – Cystic Fibrosis: Cure Found? : A new drug has been developed that drastically increases the life expectancy of some sufferers of cystic fibrosis (CF), so can we say that CF now stands for ‘cure found’? Ian Russell – Lighting the Flame, Not Just Filling the Bucket: Ian Russell will demonstrate how his quarter-century-old science show for children evolved into a distillation of his personal ‘science communication philosophy’. He will also explode some custard. 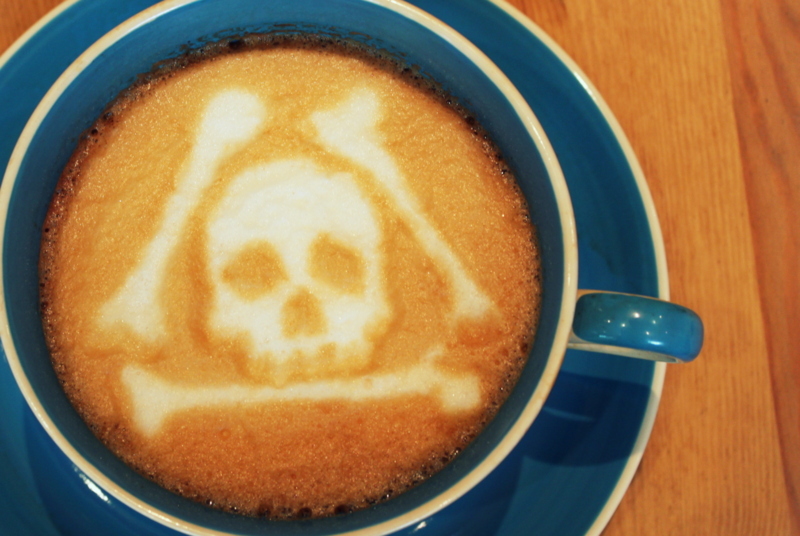 One of our speakers came up ill at the last minute* and so I put together a slightly longer than originally planned presentation on the ‘The Hidden and Forbidden World of Coffee’. The aim was to get the night started by reminding people about the origins of what had brought us all together… coffee (and by association, coffee houses). It must have gone over alright because during the Q&As afterwards someone asked me about coffee plants, to which I had to respond, “I’m very sorry, but I don’t actually study coffee – I study human remains!” These are very different things. We did manage to come up with an acceptable answer though: the bitter-tasting caffeine in the coffee plant is a toxic deterrent to many animals, which is of benefit to the plant (although sadly not as much since us humans discovered we love that delicious bitter toxic taste). There was an awful lot of interest in the speakers’ topics – we know now that next time we’ll have to plan more time for discussion! If you missed the night, there is no need to fret about missing the amazing research that was discussed, as there will be interviews with all the speakers up on the website in the future. But if you can’t wait for the interviews, there were a couple of individuals who attended the night who mentioned it in their blogpost roundups of the Science Festival. They also have pictures, which is great because I was too busy to actually snap any on the night. There are a lot of science communication endeavours around and Penny University is a part-time love, which I wish I could devote more time towards (we do have more interviews in progress, swearsies). I really enjoy the other events that are going on out there that engage audiences with academic research. I attend many of them – and recently I’ve started participating in them too by giving my own talks. However, I like to think that Penny University has something a little different (which honestly, is probably the lack of alcohol – so either you’ll love the difference or you’ll hate it). This live event was a massive learning curve and I’d like to take the time to thank everyone at the Festival who helped make it happen, as well as everyone who attended, and of course everyone who presented. If you are interested in there being more live Penny University events, please let us know! We promise to keep learning every time we do one, so they just keep getting better (and tastier). * Deborah Oakley – A Pharmaceutical Revolution: Transparency in medicine is vital: the All Trials Campaign and why it’s so vital. Deborah will also be interviewed for the website, so no one need fret – even if they were there! Welcome back from our (slightly longer than unintended) hiatus. It has been a very busy summer with lots of academic progress, outreach events, and planning for the future. There have been open days, science festivals, and site visits galore… and some very nifty technological updates! It is less than one month until the Manchester Science Festival. LESS THAN ONE MONTH! Penny University will be hosting a 21st Century Coffee House on Tuesday, October 29th, complete with an hour of talks on a wide variety of topics – there will also be demonstrations and hands-on activities (and coffee) (and tea). The line-up of presenters will soon be announced, so please check back in the next week or so to find out what we’ve got in store (or you can follow us on Twitter for regular updates). While not under the name of Penny University I will also be running another event as a part of the Science Platform on Monday, October 28th. There will be researchers and students from a few universities with The Exploded Skeletons session. You can come get hands-on with the archaeology of bones. Put our exploded skeletons back together, explore the anatomy hidden inside your body, and learn what humans different – and similar – to other animals! This has been an incredibly popular event in the past and the activities are great for people of all ages, so do drop by whether it’s for a few minutes or the whole day. Now, before I wrap up I’d like to extend another call to any and all PhD students, post-doctoral researchers, and early career researchers, as usual, to have their work featured on the site. However, given that it’s October and we’ve got a new raft of students starting I would also like to extend the offer to students who have recently completed their Masters. I know of some fantastic research completed by Masters students over the last few months and it would be wonderful to share it on Penny University, so spread the word. It doesn’t matter if you’ve gone on to do a PhD, started a new job, or are lolly-gagging about… get in touch. It will become quite clear as you read on that this is not an interview. This is one of those not-an-interview-posts I was talking about last month. Enjoy! This past Sunday I was lucky enough to attend one of the most incredible festivals – Live from Jodrell Bank. Held at the Jodrell Bank Observatory in Cheshire, which hosts a number of radio telescopes including the ever impressive Lovell Telescope, the weekend featured an incredible line-up on the Music Stage and a fabulous array of group in the Science Arena. It was a beautifully sunny day, the men’s Wimbledon final was on the big screen, and people of all ages were out in great numbers from the minute the gates opened. There was ice cream, paper rockets, dancing, a model LHC, music, florescent slime in cups, sun-toasted marshmallows, food and drinks, ice-cutting diamonds, and so much more! I was attending the festival as a part of Science Grrl, who had a tent in the Science Arena on both Saturday and Sunday. We encouraged people to talk to us about science as well as our individual research (joining me on Sunday were Gemma – a nuclear physicist and Liz – a bioarchaeologist librarian), learn more about what we do as an organisation, support us by picking up some brilliant merchandise, and we also tested people’s knowledge of nine amazing female scientists – and taught them more about them – in our ‘Who is She?’ game. This is the first event where we’ve had this game (the brain child of Heather Williams, constructed by my capable hands) and it was an enormous success! It involved nine photos of nine female scientists, some well-known and some who should be well-known – all who have had a major impact on their area of science (and the wider world). We then asked people to try and match nine names and nine areas of science to the photos. When we asked people if they wanted to have a go, the initial reactions of people ranged from, “Yeah, I’ll give it a bash!” to “Uhh, no thanks, it would just be embarrassing!” but we encouraged people to try it with the promise of hints… really good hints! Also by saying that as a prize they could go next door to University of Manchester biology tent and make a cell-cookie, which they could then eat (they could have done this anyway, but it seemed to work). By the end of the game people were impressed with how much they actually knew – either about the individual scientists or the areas of science – and how much they learned. It was an absolute pleasure to help everyone (women, men, and children – playing solo or as a group) learn about the individuals featured in our game. We also had mini-biographies on each of the women, which was handy because people had a lot of questions once they learned a little bit in the game. By far the most ‘popular’ individual of the day was Hedy Lamarr. I thought that given the level of interest (and surprise) people showed upon learning more about Hedy, I would post her mini-biography up here for people to read. If you are interested in hearing more about the other women we featured, let me know and I’ll post their mini-biographies up too! Oh and in case you are interested, Live from Jodrell Bank will be back (along with the Science Arena and Science Grrl) at the end of next month. You should come check it out and say hi to us while you are there! 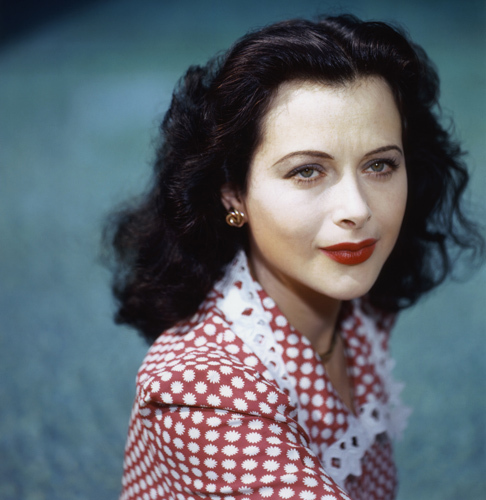 Hedy was born in Vienna, Austria-Hungary. She was an only child and studied ballet and piano from the age of ten. Her mother was a pianist and her father was a bank director. Hedy is most well known for her life as an actress, celebrated for her great beauty as a major contract star during MGM’s “Golden Age”. She appeared in over thirty-one feature films! However, she is also less well known for her talents in mathematics. Hedy and composer George Antheil, her neighbour, invented an early technique for spread spectrum communications and frequency hopping, necessary for wireless communication from the pre-computer age to the present day. It was based on a musical score that involved multiple player pianos playing simultaneously. Together they submitted the idea of a ‘secret communication system’ for patent in 1941 and receive it in 1942. This early version of frequency hopping used a piano roll to change between 88 frequencies and was intended to make radio-guided torpedoes harder for enemies to detect or jam! Hedy wanted to join the National Inventors Council but was reportedly told by NIC member Charles F. Kettering and others that she could better help the war effort by using her celebrity status to sell War Bonds. It wasn’t until 1962 that their idea was implemented, when it was used by U.S. military ships during a blockade of Cuba. Following this, their patent was little known until 1997 when it was given an award by the Electronic Frontier Foundation, lead to Wi-LAN Inc. acquiring 49 per cent of the patent in 1998. Hedy and George’s frequency-hopping idea serves as a basis for modern spread-spectrum communication technology, such as Bluetooth, COFDM used in Wi-Fi network connections, and CDMA used in some cordless and wireless telephones. For her contribution to the motion picture industry, Hedy Lamarr has a star on the Hollywood Walk of Fame at 6247 Hollywood Blvd. But it has only been since her death that she has been truly celebrated for her contribution to science! She featured as a Boeing ‘woman of science’ in 2003 (with no mention of her film career), been the subject of an Off-Broadway play ‘Frequency Hopping’, and her story – along with George’s – has been covered on the Science Channel and Discovery Channel. [Side note: One of the things we usually do as Science Grrls is wear a badge that says, “I’m a Scientist, Talk to Me” to encourage people to come up and well… talk to us. Following the end of the Science Arena Gemma and I stuck around to enjoy the music, but both of us at left our badges on without realising. We had people asking us questions and talking to us in the crowd throughout the night! I think I might start wearing a badge like that all the time. What do you think?